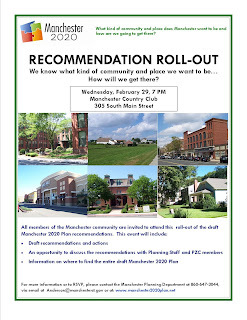 Make sure you don't miss the Manchester 2020 Recommendation Roll-Out on Wednesday, February 29 at 7 p.m. at Manchester Country Club! The Manchester community has been hard at work over the past year and a half, developing a vision and plan for what kind of community and place Manchester will be in the year 2020. Hundreds of residents, business owners, board and commission members and other stakeholders have participated in what we have called the Manchester 2020 planning process. The Planning and Zoning Commission and Town Staff are now ready to present the draft recommendations to be included in the Plan. We need your input, comments and suggestions. 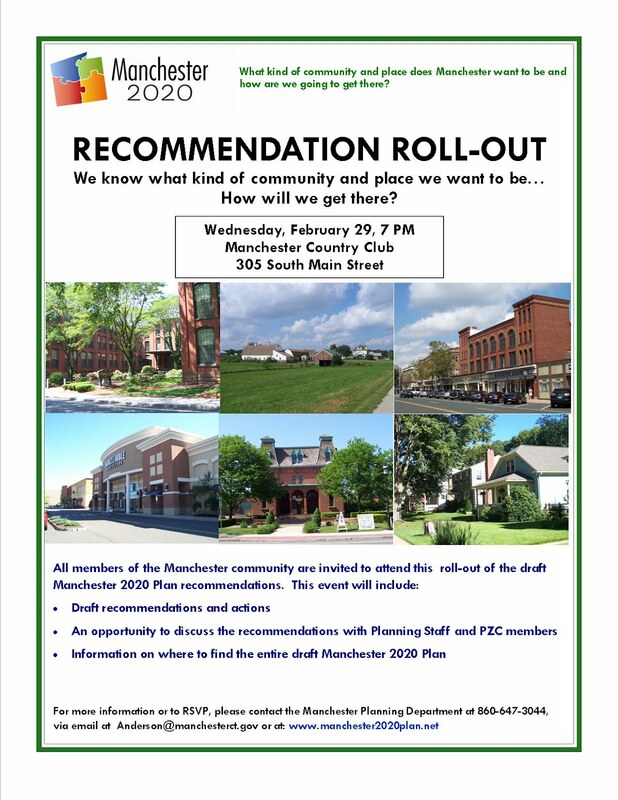 These recommendations will be presented at the Recommendation Roll-Out at 7 pm on February 29 at Manchester Country Club. All members of the public are invited to attend. Participants will be invited to comment on the draft recommendations and given information on how to access a draft of the entire Manchester 2020 Plan for the first time. RSVPs are not required, but are appreciated. Please email or call the planning department at anderson@manchesterct.gov or 860-647-3044 to RSVP. Thanks in advance for your continued interest in Manchester’s future!